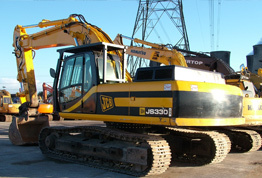 Check all used plant and agricultural equipment. Watch this short video to better understand the plant theft problem and see how checking items with TER can help protect you from buying or handling stolen equipment. TER assist the police with roadside plant and equipment checks. See us in action as we identify potentially stolen goods as part of Operation Trivium. Since 1995 TER has made more than 1,996 stolen equipment recoveries, valued at more than £11.5m, for UK equipment insurance companies, businesses and individuals. Helping the police identify plant and equipment understand the equipment theft problem, know what to look for and to have the technical knowledge to initiate an investigation. News and information for farmers and owners of agricultural equipment, protecting your agricultural and farming equipment investment. Loss prevention and security techniques for equipment owners and hirers. An in-depth guide outlining the many ways of protecting your investment – many of which are cost-free. All the latest equipment theft and recovery news and business sector updates from the equipment theft and recovery experts. © 2019, The Equipment Register. Site design: The Design Workshop. Database powered by Ghost.